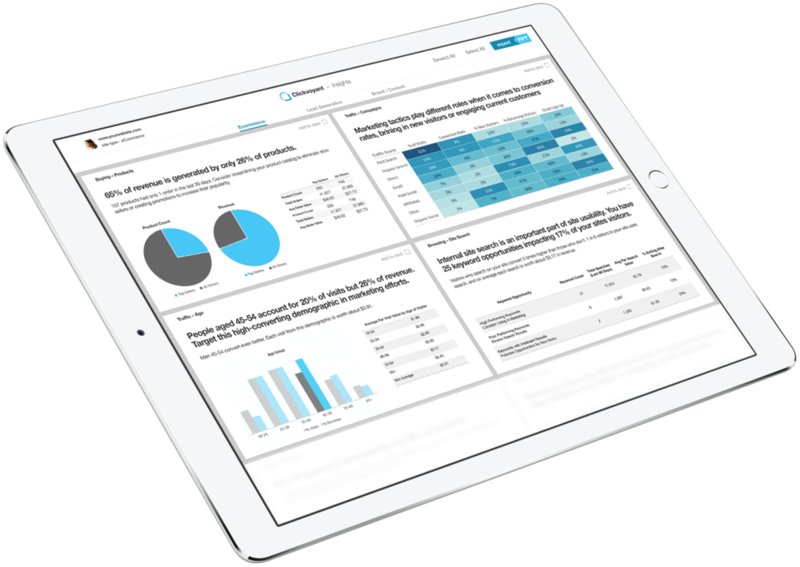 Provide clients with key insights and guidance in minutes instead of days. Export client-ready and editable PPT or PDF presentations in an instant. Clickvoyant provides clear insights with specific calls to action, supporting data, and methodology. Imagine if you had a team of analysts working for you that never slept. Clickvoyant combines web analytics expertise with automation to review mountains of data and find crucial insights (with supporting data and transparent methodology to back it up). If you don't currently offer analytics services, Clickvoyant provides a powerful yet accessible tool to get you started. If your agency already offers analytics, Clickvoyant amplifies your capabilities by helping you find hidden opportunities, quick wins, and areas where you can deep dive to make your client more money in less time. Our tool utilizes Google Analytics data and requires no installation. If you don’t currently use Google Analytics we’ll walk you through setting it up. Customizable, client-ready deliverables in minutes. Easily select slides to export. Each slide is fully editable with the ability to customize to be on brand. Detailed methodology notes are included along with supporting details so you can present confidently to your client. Clickvoyant is an analytics tool that integrates with any site that uses Google Analytics. eCommerce Sites, Lead Generation Sites, Brand Sites, Media Sites, etc. Runs data diagnostics to check your client’s Google Analytics account for implementation errors, missing data integrations, or other data quality issues. Appendix section includes detailed recommendations, how-to guides, and other supporting information so your team can take action. We recommend specific actions to make more money, all based on your client's data. We provide supporting data and clear methodology so you can confidently understand the insights and take a deep dive with your clients if needed. Help your clients leverage their winning campaigns, landing pages, customer segments, cities, DMAs, and products. Monthly service hours included with Clickvoyant analysts. Ready to check out the demo? View the tool and see the types of insights and how easy it is to export a powerpoint presentation. Do you currently provide analytics services to your clients?